This dish was supposedly created in New York at Delmonicos Restaurant in honor of the newly purchased territory of Alaska. This is called Omelette Norvégienne in France. The novelty of this dessert lies in the contrast between the frozen ice cream inside and the very hot surrounding meringue. Bake a sheet of sponge cake about 1/2-inch thick. Using a 4-inch cookie cutter, cut 2 circles out of the cake and place them on a small baking sheet. Mix 1 tablespoon of the liqueur with the syrup and imbibe the cake circles with the mixture, using a small pastry brush. Place 1 large or 2 small scoops of ice cream in the center of the cake circles. Two small scoops of a different flavored ice cream may be stacked. Place in freezer while preparing the meringue. To prepare the meringue: Prepare an Italian merigue by combining the water and sugar (or evaporated cane juice) in a small heavy saucepan and boiling until the mixture reaches 280 degrees on a candy thermometer. When the temperature reaches 250 degrees, begin whipping the egg whites and pinch of salt in an electric mixer. Whip until solf peaks form. Stop whipping and wait for the temperature to reach 280 degrees. Remove the saucepan from the heat and with the mixer on low, slowly pour the boiled sugar into the egg whites. Add the lemon rind, orange rind, and vanilla extract and continue whipping for about 4 minutes to cool the meringue. To assemble the Baked Alaska: Remove the prepared cake circles with ice cream from the freezer and place on a sheet pan. Place the cooled meringue in a pastry bag fitted with a star tube. Beginning on the circle of sponge cake, cover the ice cream completely by forming asending concentric circles of meringue. 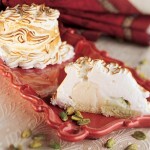 Use any extra meringue to further decorate the 2 Baked Alaskas. Place the sheet pan in the pre-heated oven and bake until nicely browned, about 5-6 minutes. 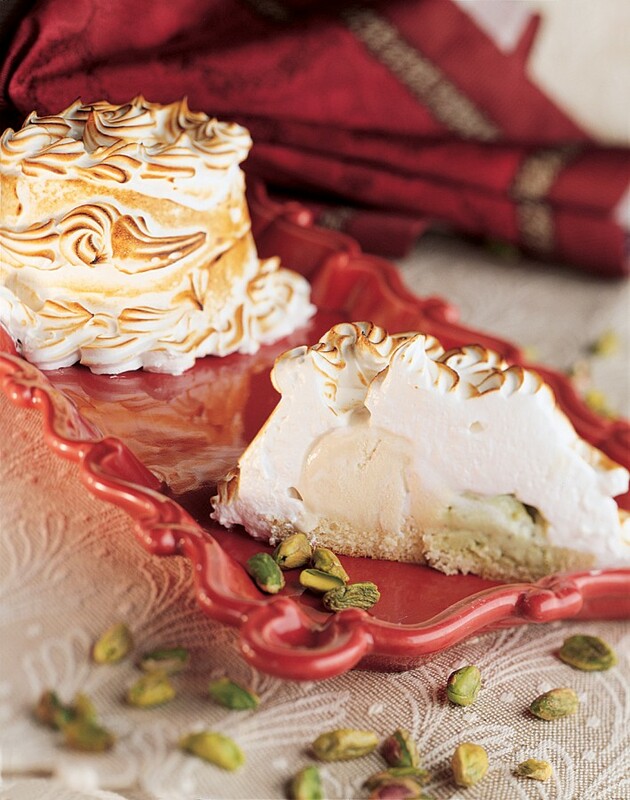 Remove from the oven and place each Baked Alaska on a warm plate. Pour 2 teaspoons of slightly heated brandy over each dessert and flame in front of your guests. Variation: Substitue 2 large cookies for the cake circles.